Justin Welbe became the new Archbishop of Canterbury this week. (CNN) – This week much of the world focused on the presidential election in the United States, so in this post we thought we'll highlight some other stories from around the world. This week a former oil executive became the new Archbishop of Canterbury. 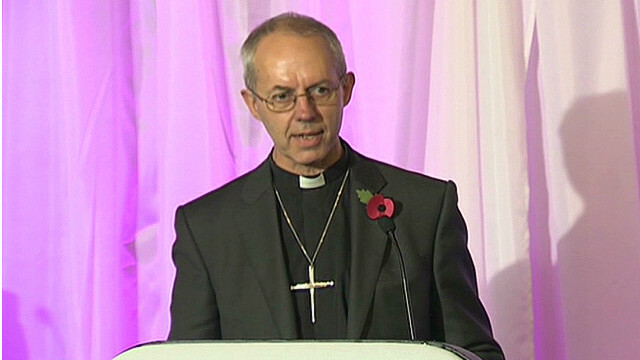 Justin Welby will be leading the Anglican Church. We found this profile by BBC Radio 4 which was originally done in late September when Welby was one of the candidates. They interviewed some of his former employees and it sheds some light on the kind of leader he may become. President Obama will travel to Myanmar this coming week as part of an Asia tour. His visit is meant to validate the countries move towards democracy. This story from Deutsche Welle Radio titled "Human rights on the improve in Myanmar" talks to people in Myanmar who value their new freedoms, but are still apprehensive after years of repression. A lot of countries want to help end the Syrian civil war, but their influence is mostly felt in humanitarian help for refugees. This week in Geneva there was a humanitarian forum hosted by the UN that is already planning for a growing refugee crisis in 2013. This report is titled "Humanitarian forum rings alarm bells for Syria." It's from World Radio Switzerland. In our search for stories we stumbled upon this story from Deutsche Welle about child trafficking in Cameroon. It's a chilling look at the worldwide problem. EVERY hINDU, FILTHY IS INVITED TO FEAST ON THEIR COW MAMAS DUNG AND GET HIGH ON THEIR COW MAMA'S URINE FREE OF CHARGE ALONG WITH hINDU FILTHY CROW'S.Word hindu is based on Latin word hindered, negative, Hun, great, Han, to be in greatness, hin, negative to both of them. hindu, a noun in negativity, hinduism, way of negativity To learn about hinduism, criminality of hindu's, criminals, plwase visit limitisthetruth.com. hindus, ignorants, please bring your own glass and spoon to feast.